Holy smoke, what a crush of humanity! My head’s on a swivel. I use it. 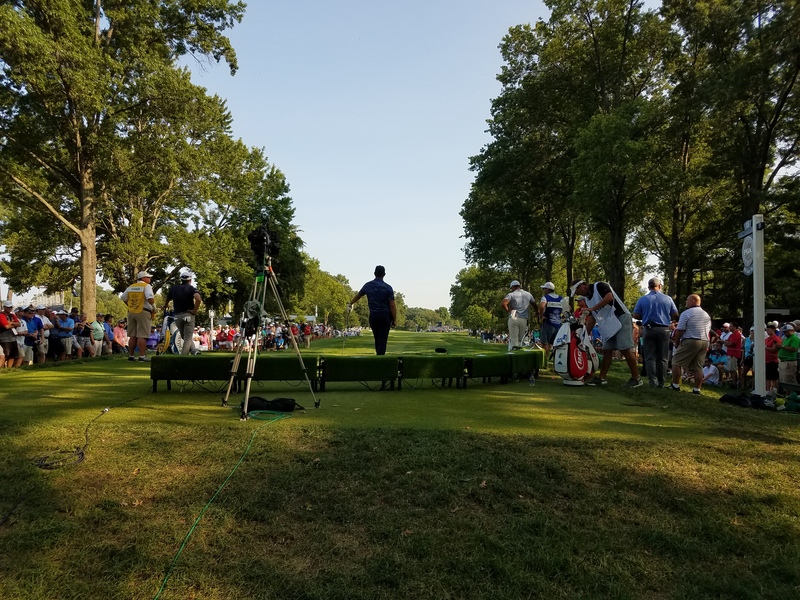 on August 13, 2018 at 6:20 pm Thomas Shrout Jr.
You blog about the PGA prompted me to recall my two trips to the Bellerive Country Club for major golf tournaments; the 1992 PGA won by Nick Price and the 2008 BMW Championship won by Camilo Villegas. Bellerive has an interesting history which is partially told by the Post Distpatch in this 2013 article https://www.stltoday.com/news/local/education/from-country-club-to-university-umsl-marks-a-milestone/article_0efd7ef2-28a8-502a-b7ce-0d52cf61b0a7.html in a story a few years back and Wikipedia’s account of the history of Bellerive https://en.wikipedia.org/wiki/Bellerive_Country_Club. The original club was located in the east-to-west flight path of Lambert Airport and now the location of the University of Missouri-St. Louis. That is what jogged my memory. In 1992 a friend had an extra ticket for the PGA tournament and I went. We, like you, planted ourselves at a certain hole and watch the various groups go through. I was rooting for Tom Watson and Hale Irwin; Tom, of course, from Kansas City and Irwin from St. Louis. It was fun and just like this past weekend packed. I laughed out loud – not safe for wealthy white golfers, but ok for college students? What is not mentioned in the brief internet review I did of Bellerive is the demographics of that part of North St. Louis County was rapidly changing. UMSL is located about 2 miles south of Ferguson to give you an idea. 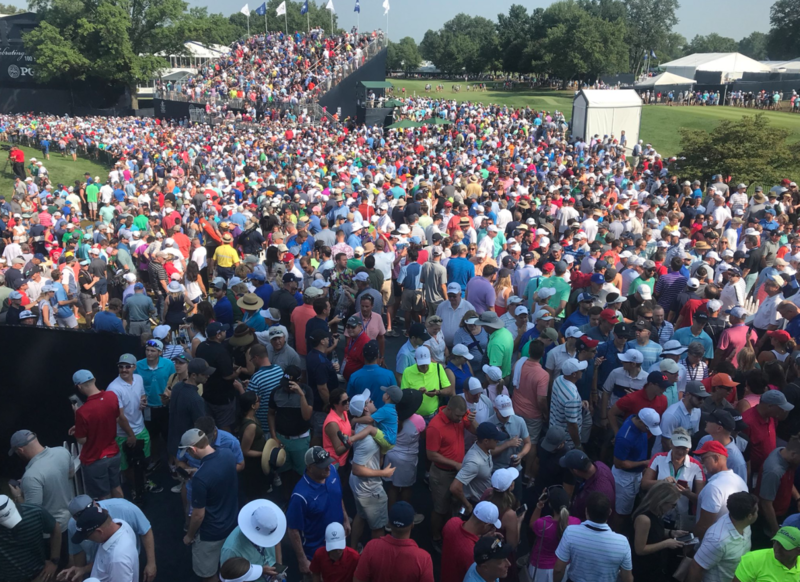 Good stuff, Tom…I should have known you, as a former longtime St. Louis resident, would have something to add about Bellerive. …I only saw a couple of homes in the area — the developers did a good job of making sure homes didn’t back up to the course — but, man, they are big. Great report JC! St. Louis is one of the great golf towns in the U.S., as evidenced by the 30 St. Louis Evans Scholars, caddie scholarship winners, currently at Mizzou! Great golf courses, and great support of the “walking game”! on August 13, 2018 at 8:34 pm Thomas Shrout Jr. I like random associations: I knew Alan Purdy and was a classmate of his oldest son George. If I remember correctly, Alan was a founder of the Evans Scholars. We had a great time. Brooks Koepka is a stud! It’s cool to see Tiger Woods remain healthy and get much closer to championship form. Mr. Purdy was, actually, the first Faculty Advisor at the Missouri Chapter of the Evans Scholars in 1968. Chick Evans was the founder of the Caddie Scholarship program in 1932. I was in that first Freshman class and knew Mr. Purdy well. JimmyC…thanks for a very informative and interesting account of your two days in “golfland.” I felt a bit intimidated reading the reactions to your blog. I never heard of Bellerive…nor the Evans Scholarship Fund…nor even Brooks Koepka!!!! But, it is nice to remember that we do have something in common…if memory serves me correctly, we have both pared hole #3 at Bellarmine Golf Course. I remember every hole on that course, John. (Took me a while to recall No. 7.) No. 3 was a very short and easy hole on flat ground. No. 2 was the longest and hardest, crossing the gulch at the bottom of the hill (where we used to sled in winter) and ascending to an elevated green. Great that you got to attend. I’ll never forget the two days I attended the 1965 US Open at Bellerive as a teenager. Player won it, but we got to see all of the old greats — Palmer, Nicklaus, Snead. I vividly remember Tony Lema cussing a blue streak in a sand trap, way out of contention and well away from the cameras. They sold cardboard periscopes in order to see over the heads of the people in front. Don’t think that’s allowed anymore. Fantastic story about Lema, Leigh. Do you remember they used to call him “Champagne Tony” because after victories he would buy champagne for the media members? He was a very charismatic guy. Checking Wiki, he won the 1964 British Open at the Old Course at St Andrews in Scotland. Two years later, he and his wife Betty died in the crash of a small airplane. The pilot and another woman also died in the crash. Lema was 32. I went also Friday and Saturday. Like you said a sea of humanity. Crazy but interesting once you settled in. We didn’t eat at all on Saturday because the food lines were over an hour long and no one wanted to give up that much time for a hot dog! Also on Saturday we settled into the wooded area between 17 and 18. All the major players passed and shot right in front of us! We also had 3 shots into this wooded area. The players had to come into the wooded area and you could tell they would rather stay on the course than be in there with us. Fun though! The roar of the crowd from the guy who hit the hole in one from clear on the other side of the course was amazing! So interesting. Don’t know if I will do it again, but it was fun! …I drove over from KC on Saturday and didn’t get to the course until 4:15. When I was arriving, much of the crowd was leaving, and I felt like a minnow swimming upstream. But I still got to see two and a half hours of golf, including several of the leaders. For some reason, Sunday went much more smoothly from the logistical standpoint, possibly because most of the kinks had been worked out of the arrival and departure system. You are absolutely right, though, Bill, the fans were engaged in just as much of a battle as the players.